Paramount sold the the distribution rights for Jason Voorhees to New Line Cinema in the early 1990's and the upstart company quickly began production on Jason Goes To Hell. A mythology based story was implemented that would explain the origins of Jason's power and re-introduce the Voorhees family to fans. The look of Jason was given a complete redesign melding features of the character from Part 2 with different components of Part 7 and other incarnations of Jason. 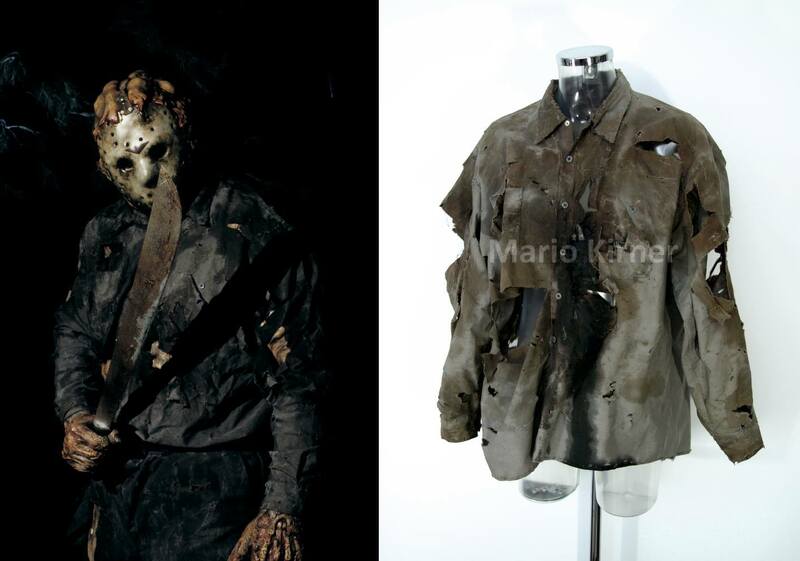 Mario Kirner is the collector of many rare items from the franchise and has curated a museum of truly magnificent pieces of Friday The 13th history. Recently, Mario revealed some new items from the museum for fans to enjoy. Below are a screen used prop head which was used to be pulled under the ground by the FX team at the climax of Jason Goes To Hell. The hockey mask that is now sitting on the prop head in the photo is the hero mask worn by actor Kane Hodder and used during the second part of the film. The second item is the Hero shirt worn by Kane Hodder as Jason Voorhees in the film. This shirt was used in the second part of the film and can also be photo matched to many publicity pics. It comes with fake blood (devilish black) still visible at the center of the chest where he gets stabbed with the magic dagger to send him to hell. These are truly amazing pieces of history from Jason Goes To Hell and the franchise. Make sure to visit the Props Museum to see even more props and clothing from the franchise.